£40 is bit much to ask for an adapter these days especially when competitors' products are offering USB media playback for the same price. However, build quality, performance and novice friendly software make the MDR-240 a reliable switchover upgrade that could happily sit in the living room as well as the bedroom. When we tested the TVonics MDR-250 in our April 2009 issue we declared it to be a little expensive but with enough features to raise it above the Freeview adapter crowd. 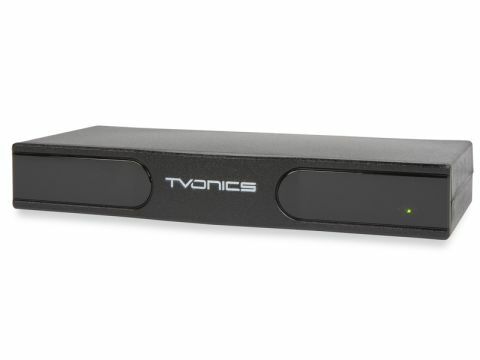 This new model, the TVonics MDR-240 has seen a step down in numbering but has been developed to bring it in line with the government's recently issued required standards for Freeview boxes. Chief among these – and topical considering recent events – is automatic retuning when required. In addition, users on the English and Welsh borders may find they're given the choice of the region from which they wish to receive signals. Consuming a reasonable 3.9W in operation, outwardly, the MDR-240 looks pretty much the same as its predecessor. It's around a third smaller than the average paperback novel, with a mostly black casing (with exception of TVonics' logo) fronted by an IR window but no display to speak of (just power and standby indicators). A UHF loopthrough on the rear means you can pipe the analogue TV signal to other equipment. However, TVonics has stopped short of including a modulator for watching digital channels on older TVs that may be short of Scarts. Speaking of which, twin Scarts have been crammed into the rear panel; the TV Scart gives you a choice of outputting in composite, RGB or S-video and the second Scart can be connected to a VCR or DVD recorder for recording in composite quality only. There's also a hi-fi line output but no digital audio connectors. The software is also very similar to that on the 250, with text clearly legible against a predominantly blue background and help pages provided for those who may get confused by jargon. You can perform automatic or manual scans and the tuner proved adept at quickly pulling in channels from all multiplexes at our Central London location. Once located, these are displayed as a long list, although, once again, we find that TVonics has neglected to provide a favourites option in favour of letting you re-sort or hide channels in the main list. The EPG displays eight days of data as a full-screen grid overlaid on the current channel with channels down the left and programmes to the right. You can scroll through information for nine channels at a time and skip back and forth in 24-hour chunks using the coloured buttons on the remote. You can also bring up full-screen programme synopses. There's a nine-event timer for scheduling external recordings with once, daily and weekly repeat options, which can be set up manually or by selecting shows in the EPG. The programme information banner goes further than most – letting you browse data including synopses for programmes on other channels in addition to the one you're tuned to for up to seven days in advance. Other notable features include audio description and a screen saver mode for plasma displays. The tuner delivers decent-looking pictures overall, with little blockiness in evidence. Even creaky episodes of Murder, She Wrote looked good when viewed on a brand new 42in Panasonic plasma. It's a shame there's no digital connection for home cinema systems but if your TV's speakers aren't the greatest, then the hi-fi line out proves a crisp enough alternative.